Sega and developer Obsidian Entertainment conspire to bring you Alpha Protocol, the espionage role-playing game. Is it Mass Effect meets modern-day spy thriller? After stumbling upon a global conspiracy during a failed mission, agent Michael Thorton finds himself on the run from the very country he vowed to serve. Betrayed by his superiors, Thorton's only choice is to enact Alpha Protocol, going underground to reveal the insidious plot. Since its first public appearance, the gaming press has been comparing Alpha Protocol to BioWare's Mass Effect, citing numerous similarities, from the game's RPG progression to its branching dialog system. With those comparisons come expectations that few games could possibly live up to. Is Alpha Protocol up to the task? Characters With Character: This was originally going to be a discussion on how much I enjoy a game calling me by my real name, but protagonist Michael Thorton is probably the least interesting of the colorful cast members in Alpha Protocol. That's not to say he isn't witty and charming; he's just outdone by folks like 80's fixated Russian mob boss Grigori, or conspiracy theorist Steven Heck, who I officially declare my new best friend. It's an ensemble cast, full of quirky characters on both sides of the conflict, that make some of the game's negative points much more tolerable. 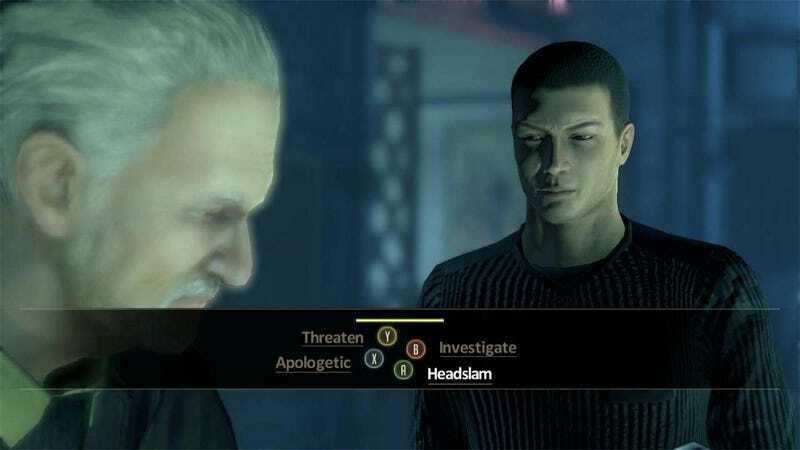 Important Decisions: During its lengthy development cycle, Alpha Protocol was compared many times to titles like BioWare's Mass Effect, mainly for its branching dialogue system and a focus on player-made decisions affecting the gameplay. The comparison turns out to be a valid one. The decisions you make in Alpha Protocol have the power to alter the course of the game entirely. Mission objectives change, enemies become allies, and allies become lovers as you make key decisions. At one point in the game I made a choice that resulted in a boss battle, during which I died. Returning to my last save point, a different dialog choice allowed me to skip the fight entirely, making a character that would be my enemy a potential ally. This powerful mechanic makes multiple play-throughs a must, if you can get past the game's glaring issues. Intel That Matters: Throughout Alpha Protocol you'll be collecting, buying, or receiving intel via the game's email system. Much more than collectibles, the intel you gather as you play also has a strong effect on the choices you have to make and battles you have to fight. Intel can tell you how an NPC will react to your character's attitude choices, or give you insight into a particular boss' weak points. A combination of the right intel and the right allies can change the course of certain battles entirely. Making Your Own Way: Alpha Protocol allows you to pick and choose the skills you spend points on as you level, and does a great job of laying out the game's levels to take advantage of the skills you've chosen to hone. If you're a fan of straight-up shooters, maxing out your weapon and body skills turns you into a tank, perfect for running headlong into battle, guns blazing. Sneakier players (like me) can opt to level up stealth, sneaking up on opponents and silently dispatching them before they can raise an alarm. More strategic players can use the game's gadgets to take out their foes placing mines and then luring enemies into them. It's a game that nicely accommodates all sorts of players. Artificial Stupidity: Some enemies in Alpha Protocol possess an uncanny intelligence, relentlessly pursuing you through closed doors, diving out of the way of grenades, and circumventing traps as if there were a real human in control of their actions. Other enemies in Alpha Protocol will stand still, facing the opposite direction in the middle of a firefight. Perhaps developer Obsidian Entertainment programmed varying levels of AI into the game's enemies. If so, then at least one of them is broken. Power Leveling: Role-playing shooters generally feature enemies that scale with your powers and abilities, to keep things challenging. Alpha Protocol does not. Case in point, I spent an hour and a half trying to defeat a certain boss during the early stages of my first play-through of the game. The boss moved erratically, henchmen would spawn, and without many first aid kits available, it was a battle I was constantly losing. I set the mission aside, and came back to it after finishing most of the rest of the game. That same boss fight lasted all of 10 seconds. In fact, leveling up one particular power set makes most of the game's more difficult bosses ridiculously easy. It's a glaring imbalance. Bugs And Glitches: At least two times during my initial play-through of Alpha Protocol I had to reload a save due to being stuck between two locked doors. One door closed, which should have triggered the next door opening, but it did not. Those two instances, along with various graphical glitches, texture pop-in, and polygon tearing give me the impression that this is one game that didn't get the play testing attention it deserved. Ending With A Whimper: Alpha Protocol's ending leaves a great deal to be desired. After spending the better part of ten hours forging friendships and alliances, unraveling plots, and revealing a vile scheme that could change the political climate of the entire planet, I expected something astounding to cap it all off. What I got was a series of ridiculously easy boss fights, a cut scene where I expected some sort of giant battle, and a series of news reports while the credits rolled serving as the dénouement to this anticlimax. The entire ending feels tacked on, which is a real shame, considering the intriguing build up. With its role-playing game progression, branching dialog system, and emphasis on player choice changing the way the game progresses, it's easy to see why many previews (including one of mine) suggested that Alpha Protocol was Mass Effect for the cloak and dagger set. And while the game does manage to ape several of the more attractive aspects of BioWare's epic space saga, it fails to deliver the same level of quality. It's like the store brand equivalent to a BioWare action RPG. It has its share of delicious moments, but it's likely to leave a bad taste in your mouth after all is said and done. Alpha Protocol was developed by Obsidian Entertainment and published by Sega for the Xbox 360, PlayStation 3, and PC on June 1. Retails for $59.99 USD. A copy of the game was given to us by the publisher for reviewing purposes. Played through the Xbox 360 version of the game once on standard difficulty, and started another game to try out additional skills and conversation branches.